The dinosaurs are back and bigger than ever! The team at Isla Nublar clearly haven’t learnt from past mistakes, but whatever. It’s time to bring the park to a new generation! Well this is already beating Movieworld. It’s been twenty-two years since the events of Jurassic Park (god we’re old) and Isla Nublar now hosts the famed theme park, Jurassic World. Kids walk amongst dinosaurs, toddlers get to ride Triceratops, and spectators are wowed by the Mosasaurus in a show that puts Seaworld’s efforts to shame (they’re used to that feeling though). 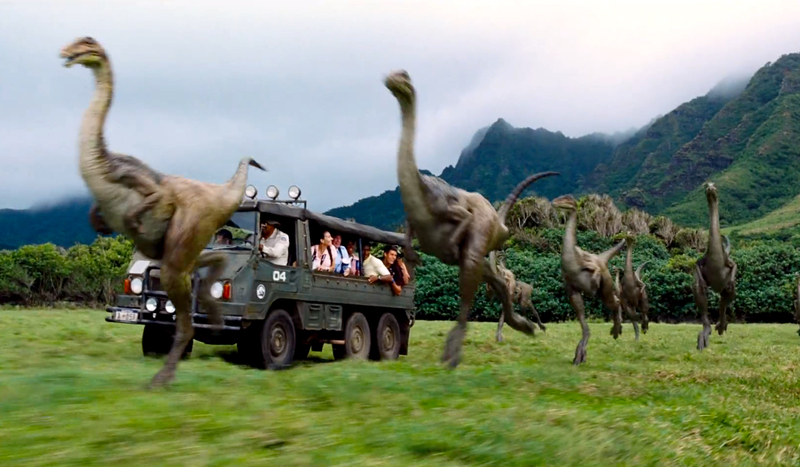 But dinosaurs are fast losing their novelty and the park needs to up their game to keep the cash flowing in. 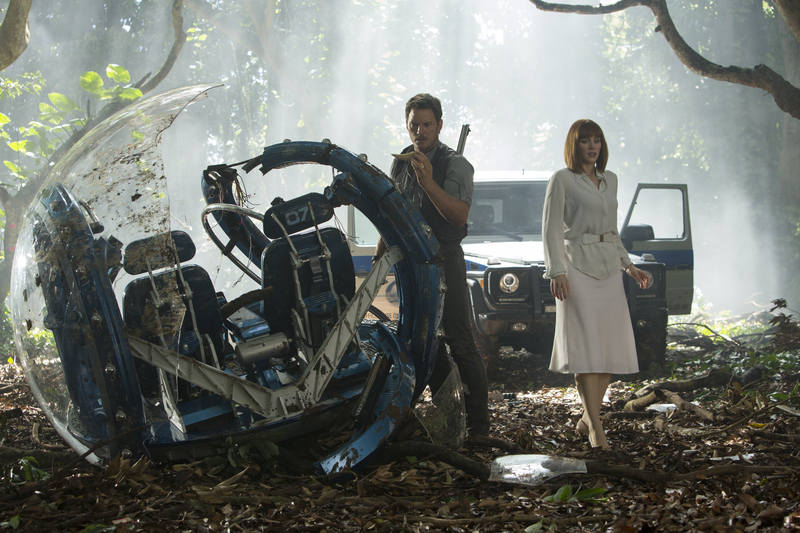 Enter their hybrid creation, the genetically-modified Indominus Rex. Raised in captivity, you wouldn’t want to set this thing loose. But… whoops. Jaws is no match for this beast. While it’s almost a rite of passage for children to get the bejeesus scared out of them by seeing a Jurassic film, be wary of taking the kids. Rated M15+ it boasts numerous scares, although it’s probably less nightmare-inducing than anything Roald Dahl has come up with (The Witches is still the scariest film of all time in my opinion). 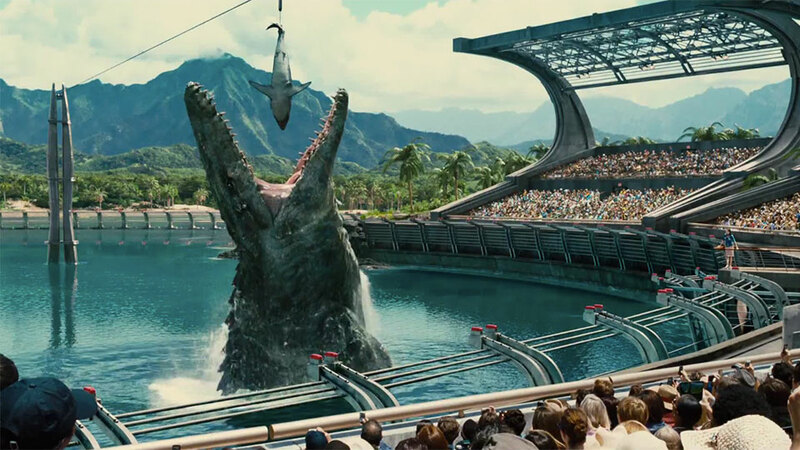 Kids may be able to enjoy Jurassic World, but just be prepared for lots of deaths – of the eaten by a dinosaur variety. I yelled out loud at least four times throughout the film, and I loved every minute of it. The first films were terrifying enough, and the updated effects (involving a combination of CGI, animatronics, and performance capture) make this reboot/sequel even more visually thrilling. I didn’t watch the film in 3D (I didn’t bother after learning it was only added in post-production) but choosing this viewing option may cause you to crap your pants. In a piece of casting perfection, Chris Pratt nails the role of the action hero with a comic edge. Women want him, men want to be him, and you’d be hard pressed to find any haters (and if there are any, jealously is clearly the issue). He whole-heartedly embraces the deliberately corny aspects of the screenplay and delivers movie gold in spades. Despite extra screen time, Bryce Dallas Howard is clearly secondary in her role as park operations manager, Claire. Kudos to the franchise for involving female players that certainly demonstrate their own heroics in each of the four films, but must they always lag behind the men? Unlike Pratt, Howard is more difficult to like, largely in part due to her heinous get-up. In an homage to original park creator, John Hammond (Richard Attenborough) she wears all white, but the styling is way off. For the love of all that is sacred: NO! Just no. No, the mauve singlet does not atone. Director and co-writer Colin Trevorrow clearly has a genuine love for the Jurassic franchise which is reflected in his finished product. Jurassic World tips its hat to its predecessors in multiple instances, with similar plot lines, patches of dialogue, and framing of shots. There are moments which feel like they’re straight out of an old school action film in terms of cheesiness and cliché, but as it feels quite self-aware you have to smile rather than scoff. Take away the updated technology and this could be right at home amongst the older films. 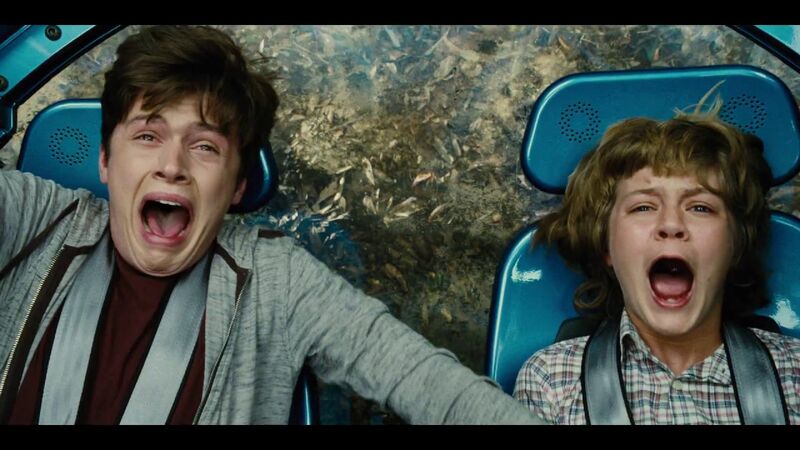 Steven Spielberg has left the director’s chair, but Trevorrow, in only his second feature film (following indie film Safety Not Guaranteed), has done an admirable job keeping the magic alive, possibly even surpassing Spielberg’s The Lost World. Rumours abound for multiple sequels following the success of Jurassic World, which begs the question: WHEN WILL THEY LEARN? PEOPLE KEEP DYING! JUST STOP! A sequel that comes twenty-two years after the original (or fourteen years after the third) is exciting, but it’s time to put these dinosaurs to rest. Then again, if Chris Pratt will be back, maybe I’ll allow it. Those that remember the original films should eat this right up (like the dinosaurs are wont to do) and those younger viewers experiencing it for the first time will be simultaneously amazed and terrified. We all know what we’re in for, and while it is mindless popcorn entertainment to a degree, it’s damn good fun.